Involvement in Heritage Singers is an opportunity for students to use their gifts to glorify God and bless the school. It also helps students gain confidence in performing and aids in developing social skills as the choir works together as a team. Students in Heritage Singers learn to develop healthy vocal habits through warm-ups, ear training and diction. The choir performs at multiple school concerts and events throughout the year including Veteran’s Day, the Christmas Concert and Spring Concert. The HCS Band continues to grow and improve each year with many students going on to play and earn high honors in high school band. Each student has a weekly 15-minute private lesson with Mrs. Jansen. The full band joins together twice a week in rehearsals for the upcoming concerts. The band will be participating in the Veteran’s Day celebration in November, Christmas Concert in December, an in-school concert in March, Spring Concert, Adventureland concert, and 8th grade graduation in May. This will be a busy and fun year making music together! Music is one of God’s gifts to us, a gift that we can offer back to Him with thankful hearts (Colossians 3:16)! Pre-K through 1st grade Music Appreciation classes use ABC Music & Me, a curriculum created by Kindermusik International, Inc. This program engages students in music and movement activities such as songs, rhymes, instrument play, and dances, promoting language, literacy, physical coordination and more. 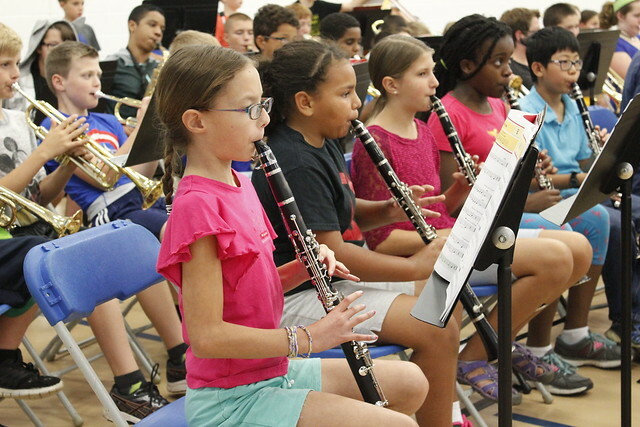 The 2nd-4th grade students learn about the historical background of music, gain an incremental understanding of music theory, and expand their musical vocabulary. Elementary students analyze various styles of music and train their ear through the use of solfege and hand signs. As a result of this curriculum path, students benefit from learning to express themselves through different forms of music; using their imaginations as they play and learn that God’s gift of music is all around us! At Heritage Christian School, we exist to serve Christ by partnering with parents to provide biblically faithful, academically excellent education.